4 Why use Registry parts? A biological part (or simply, part) is a sequence of DNA that encodes for a biological function, for example a promoters or protein coding sequences. A composite part is a functional unit of DNA consisting of two or more basic parts assembled together. BBa_I13507 is an example of a composite part, consisting of a rbs, protein coding region for a red fluorescent protein, and terminator. A device is a type of composite part that conducts an operation in the cell. BBa_I763007 is an example of a device, which uses BBa_R0051 and BBa_I13507, to regulate production of red fluorescent protein in cells with lambda cl. 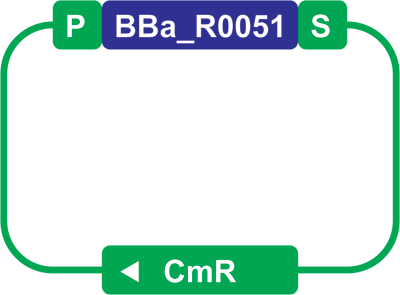 Here we have a part sample (blue) for BBa_R0051 maintained in a plasmid backbone (green). You can see that the part sample is flanked by the plasmid backbone's prefix (P) and suffix (S), which dictates the part sample's assembly standard. Samples - The Registry has samples of specified parts in its database available for request or through our DNA Distribution Kits. A sample is a physical copy of a part. We receive a sample of a part from users (maintained in our plasmid backbone), add them to the Registry's Repository, and run quality control tests to make sure that the sample matches the part. It is important to understand that there is a difference between a part on the Registry's database, and the part sample that you'll be using in the lab. Assembly Standards - A part is compatible with an assembly standard, as long as its sequence meets the requirements of said assembly standard; this means that the part does not have any internal restriction sites that would interfere with assembly, referred to as illegal restriction sites. You can check to see if a part meets an assembly standards requirements by looking at the sequence and features box. It is important to remember that a part does not include the prefix and suffix as defined by an assembly standard. Assembly Methods is the physical process of combining two (or more) basic or composite part samples together in series to form a larger composite part. There are many different assembly methods, each with their own advantages. Plasmid Backbones - A plasmid backbone propagates a sample of a part, located in between the prefix and suffix of the plasmid backbone. As such the plasmid backbone can dictate the assembly standard and assembly method of that part sample. You'll notice that BBa_R0040 is a part that is compatible with all Registry supported assembly standards. If you were to find a physical location for this part (using the Get This Part page) you'll see that there are several available samples in different plasmid backbones (pSB1C3 and pSB1A2. The pSB1C3 plasmid backbone has a prefix and suffix as defined by the BioBrick RFC standard. The available samples of BBa_R0040 are flanked by this prefix and suffix. In order to assemble an available sample of BBa_R0040 to a different part using the 3A Assembly method, you will need to make sure that a sample of the other part is on a plasmid backbone that also belongs to the BioBrick RFC standard. You can browse the Registry's Catalog of Parts & Devices where parts and devices are organized by various criteria, including function, chassis, and standards. You can also use the Registry search tools to find parts by descriptors, or specific part names. Parts range from foundational such as promoters, terminators to unique and interesting like gas vesicle parts, pigment parts, wintergreen smelling parts, etc. There is already a wealth of information about each part and device, telling you how they work and how to use them. Many of the Registry parts and devices have been user-tested and characterized, so that you can focus on building your system instead of researching each necessary component. Floating bacteria, Bacto-Blood, Cambridge pigment parts: iGEM teams and labs continue to add interesting and novel parts, devices and systems to the Registry. Physical samples are also sent to the Registry, added to the Registry Repository and tested for their quality (sequence, gel results, etc). If you've found an interesting part, and a sample of it is available, you can request it from the Registry. You don't have to make it from scratch! The standard in "standard parts" ensures compatibility between parts, allowing them to be assembled together creating new longer and more complex parts, while still maintaining the structural elements of the standard. This idempotent characteristic means that any newly composed part will adhere to its standard without need for manipulation, and can be used in future assemblies without issue. Most of the parts on the Registry adhere to the BioBrick Standard, so their samples can easily be assembled, this allows the engineer to focus on design instead of assembly. The Registry is an open community where information and experience is shared. Since the Registry uses the wiki format, users can easily make or add changes, including more information on a part's characteristics, writing about their experience with a device, etc. The Registry also has a forum and comments system, which is used as a place for discussion. If you visit the Catalog of Parts and Devices, you can browse through parts by type/function, along with other criteria. You can read the help pages for the different Registry part types below. Promoters: A promoter is a DNA sequence that tends to recruit transcriptional machinery and lead to transcription of the downstream DNA sequence. Ribosome Binding Sites: A ribosome binding site (RBS) is an RNA sequence found in mRNA to which ribosomes can bind and initiate translation. Protein domains: Protein domains are portions of proteins cloned in frame with other proteins domains to make up a protein coding sequence. Some protein domains might change the protein's location, alter its degradation rate, target the protein for cleavage, or enable it to be readily purified. Protein coding sequences: Protein coding sequences encode the amino acid sequence of a particular protein. Note that some protein coding sequences only encode a protein domain or half a protein. Others encode a full-length protein from start codon to stop codon. Coding sequences for gene expression reporters such as LacZ and GFP are also included here. Translational units: Translational units are composed of a ribosome binding site and a protein coding sequence. They begin at the site of translational initiation, the RBS, and end at the site of translational termination, the stop codon. Terminators: A terminator is an RNA sequence that usually occurs at the end of a gene or operon mRNA and causes transcription to stop. DNA: DNA parts provide functionality to the DNA itself. DNA parts include cloning sites, scars, primer binding sites, spacers, recombination sites, conjugative tranfer elements, transposons, origami, and aptamers. Plasmid backbones: A plasmid is a circular, double-stranded DNA molecules typically containing a few thousand base pairs that replicate within the cell independently of the chromosomal DNA. A plasmid backbone is defined as the plasmid sequence beginning with the BioBrick suffix, including the replication origin and antibiotic resistance marker, and ending with the BioBrick prefix. Plasmids: A plasmid is a circular, double-stranded DNA molecules typically containing a few thousand base pairs that replicate within the cell independently of the chromosomal DNA. If you're looking for a plasmid or vector to propagate or assemble plasmid backbones, please see the set of plasmid backbones. There are a few parts in the Registry that are only available as circular plasmids, not as parts in a plasmid backbone, you can find them here. Note that these plasmids largely do not conform to the BioBrick standard. Primers: A primer is a short single-stranded DNA sequences used as a starting point for PCR amplification or sequencing. Although primers are not actually available via the Registry distribution, we include commonly used primer sequences here. Composite parts: Composite parts are combinations of of two or more BioBrick parts.